Welcome to Skull Rock Cove. You’re in the world of Peter Pan, Wendy, John, Michael, Captain Hook, and Mr. Smee from Walt Disney’s 1953 classic, Peter Pan. The secluded cove is hidden behind Captain Hook’s Pirate Ship Restaurant. Get your hot tuna pie below deck on the Pirate Ship. Take the gangplank from the ship’s port side directly to the cove. Sit on a barrel at a table and enjoy your Chicken of the Sea cuisine. 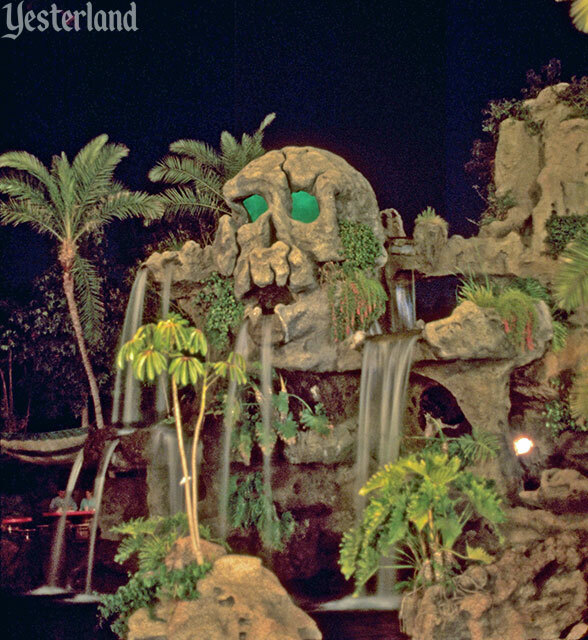 Listen to the sound of the many waterfalls emerging from eerie Skull Rock and from around it. Photo by Fred M. Nelson, Sr.
With the lantern at the stern of Captain Hook’s ship. You don’t have to buy food to enjoy Skull Rock. 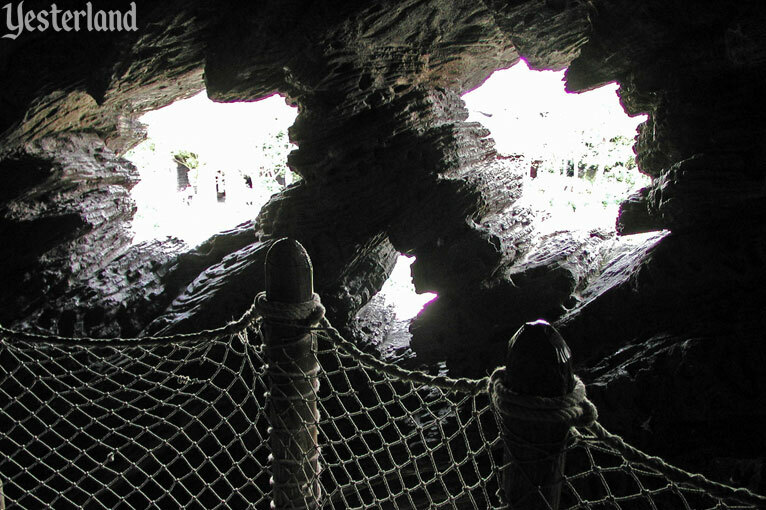 You can treat Skull Rock Cove and Captain Hook’s Pirate Ship as a walk-through attraction. 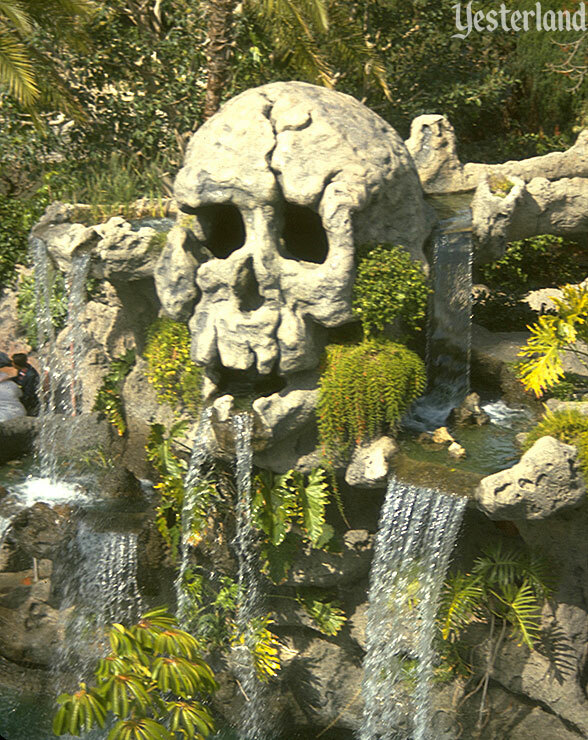 Skull Rock became part of Disneyland in 1960, joining another icon from Peter Pan, Captain Hook’s Pirate Ship, which had been in Disneyland since 1955. 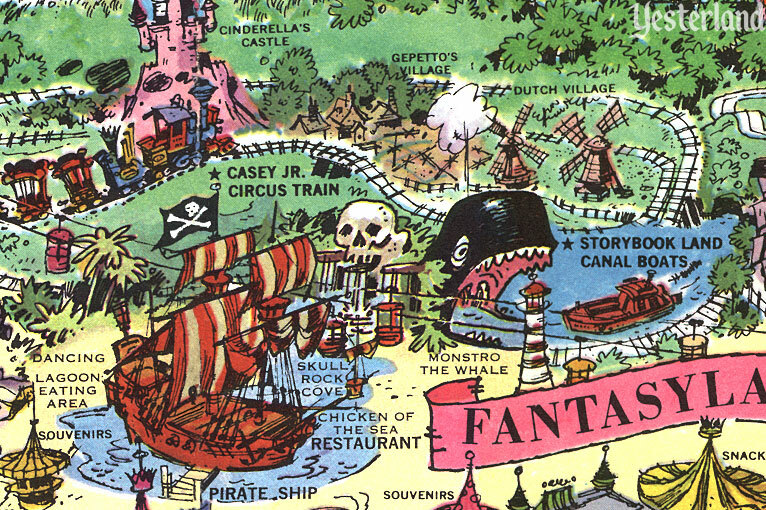 Skull Rock and the Pirate Ship were both victims of the New Fantasyland project in 1982. When the New Fantasyland opened in May 1983, guests found that the old tournament façades had been replaced by charming architecture; the old dark rides had been improved; Pinocchio’s Daring Journey had been added; and rides such as King Arthur Carrousel had been moved around to eliminate Fantasyland’s previously cramped layout. But Skull Rock and the Pirate Ship were gone—Dumbo the Flying Elephant had taken over the space. 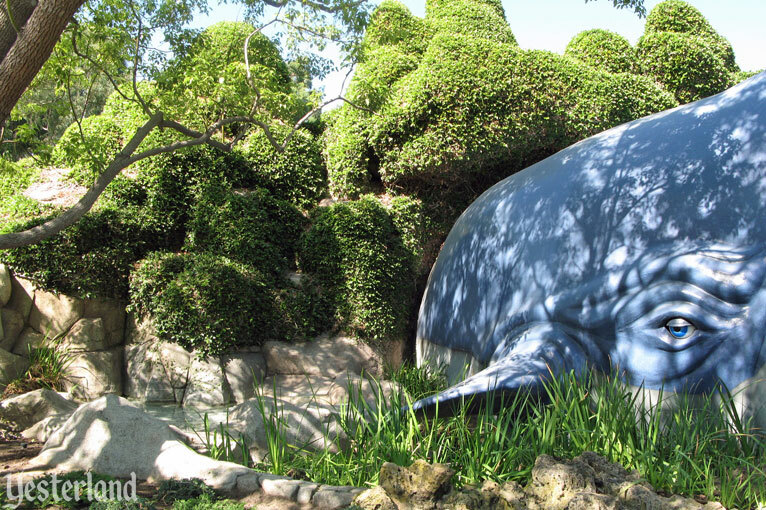 Although Skull Rock is gone, the rockwork to the left of Monstro the Whale is said to be a remnant from Skull Rock Cove. 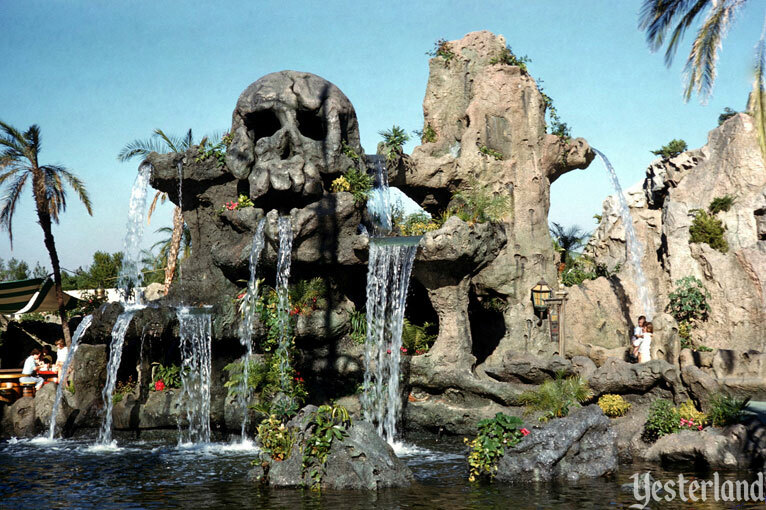 Today, you can still visit Skull Rock at a park called Disneyland. But it’s the one in France—Disneyland Paris. At the Paris park, “Captain Hook’s Pirate Ship and Galley” and Skull Rock are in an area of Adventureland called Adventure Isle. With caves, a suspension bridge, and a pirate lookout, Adventure Isle plays a similar role to Tom Sawyer Island at Disneyland—except that it’s reached by bridges, not by a raft ride. 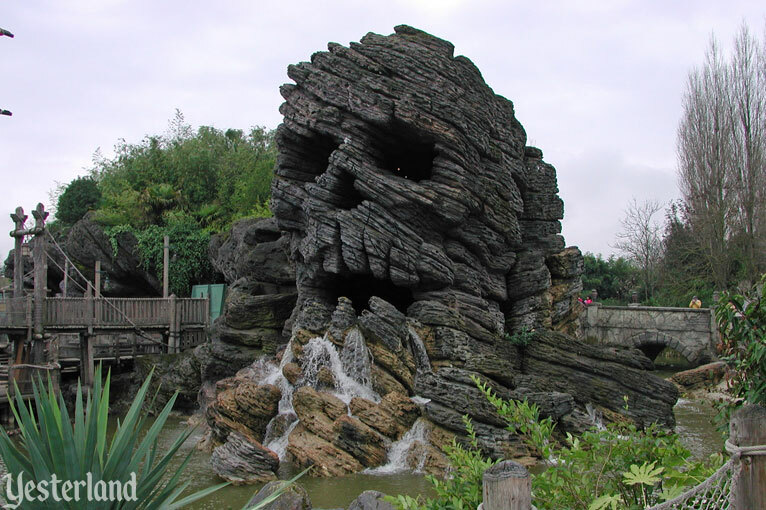 The Imagineers who designed Disneyland Paris didn’t simply dust off the blueprints for the original Skull Rock. The skull now looks like sedimentary rock, upheaved so that the layers are at an angle. The inside of Skull Rock is a cave. The eye cavities are openings that provide a view toward Fantasyland from inside the skull. 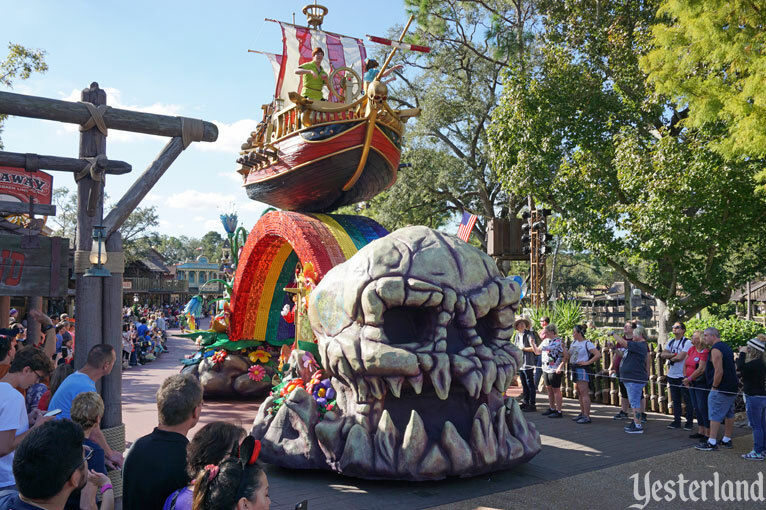 Magic Kingdom Park never had a permanent outdoor Skull Rock, but it has one as part of a long-running daytime parade, as well as inside Peter Pan Flight. 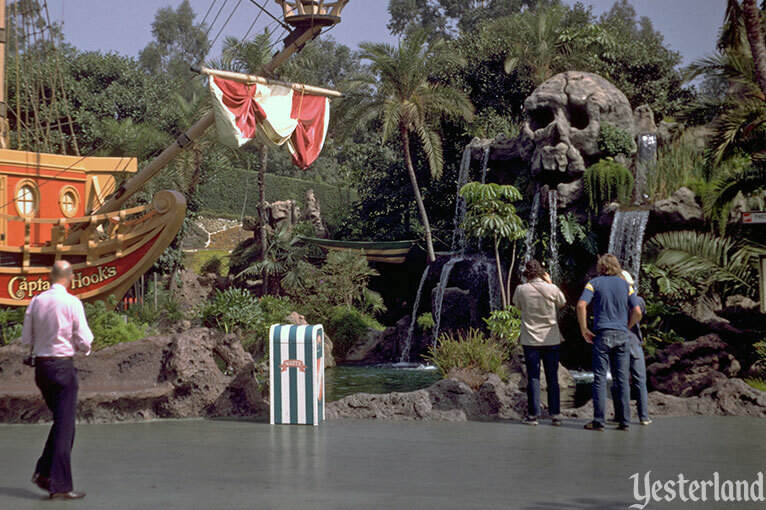 For around a dozen years, the Disneyland Hotel at the Disneyland Resort had its own versions of Captain Hook’s Pirate Ship and Skull Rock. They were part of the Never Land Pool, which opened in 1999. 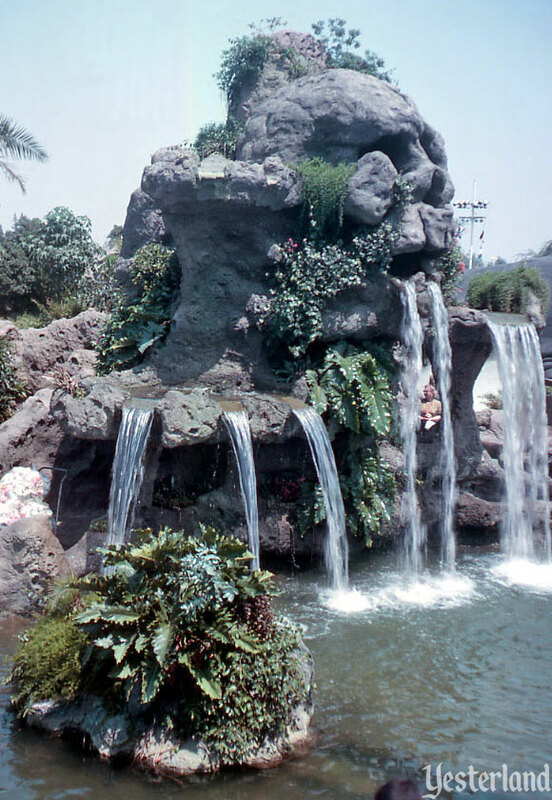 They weren’t as large and detailed as their departed cousins in Disneyland’s Fantasyland—but the old Skull Rock didn’t have a hot tub or a 100-foot water slide. 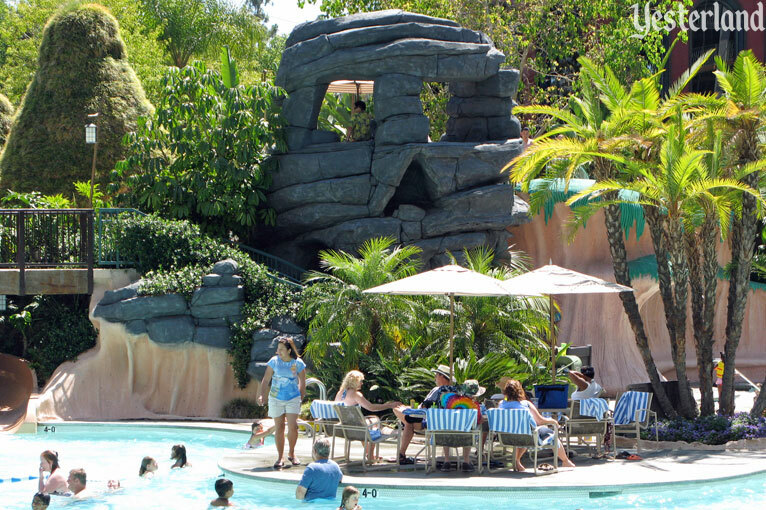 The hotel’s nod to Peter Pan didn’t survive the 2011 transformation of the Never Land Pool into the E-Ticket Pool. If you’re in Southern California and you still want to visit Skull Rock, there are three ways to do so. First, go on the Peter Pan’s Flight ride in Fantasyland. 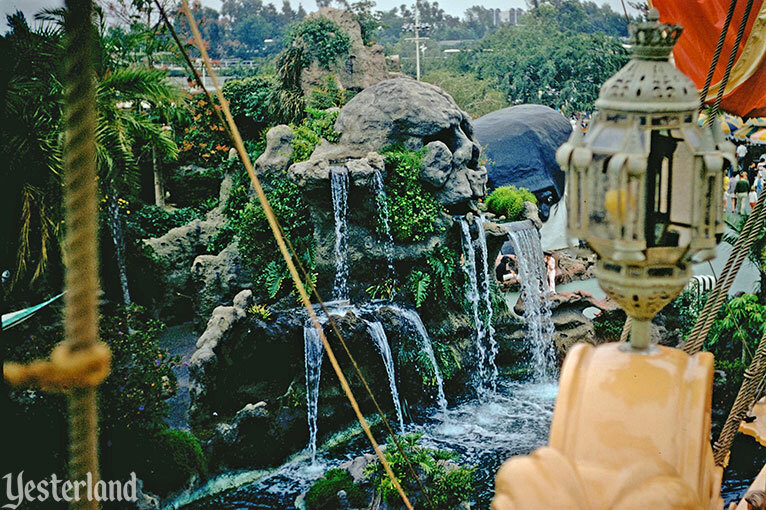 Skull Rock is part of the imaginative scenery that makes Peter Pan’s Flight a classic ride that can be enjoyed over and over by all ages. 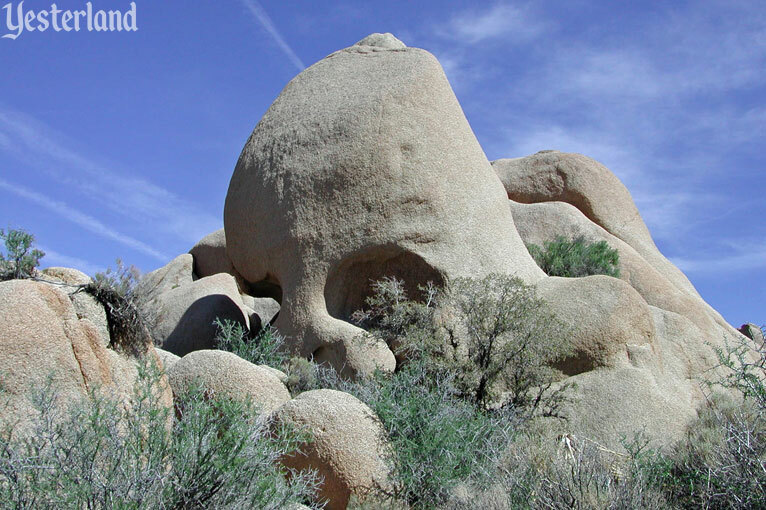 Next, drive out to Joshua Tree National Park, where Skull Rock was “imagineered by nature.” Take the 1.7-mile Skull Rock nature trail to see rock formations, plants and animals of the high desert. But you won’t find a shop with Peter Pan souvenirs (or hot tuna pie, for that matter). Finally, watch a Blu-ray or stream of Peter Pan, in which Peter Pan fights Captain Hook at Skull Rock.